An XML schema (XSD) is a description of a type of XML document, typically expressed in terms of constraints on the structure and content of documents of that type, above and beyond the basic syntactical constraints imposed by XML itself. 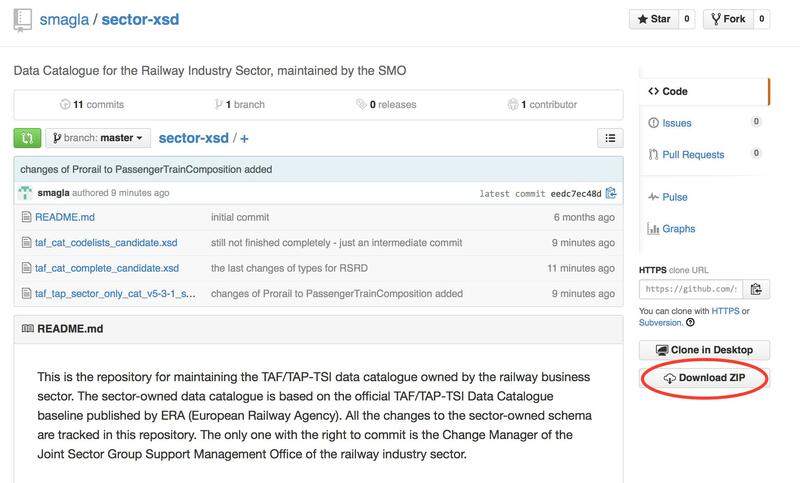 The official TAF TSI XSD schema is mantained and developed by the Change Control Management (CCM) process managed by the European Railway Agency. Nevertheless, the rail sector working groups have added their changes which are not expected to be included in Regulatory framework, but implemented and used in bilateral business agreements. The official and regulatory version of TAF TSI xsd schemas approved by TAF TSI Change Control Board and RISC. The candidate schema (taf_cat_complete_candidate.xsd and taf_cat_codelists_candidate.xsd) is the adapted official schema containing the changes applied through official process and approved by the JSG and ERA CCM WP. It’s updated on regular basis and it includes the changes that are expected to be found in the next version of the TAF TSI xsd schema. The Sector schema is the “candidate” schema where the sector messages are added in order to use the existing global elements of TAF data catalogue. . The sector messages are outside of the official TAF data catalogue and they are owned, used and maintained by the rail sector. The Github is a version control tool that contains the candidate schemas (the common metadata with the content of the approved CRs) and sector schema. Those who are implementing TAF, can easily bind the github repository to their development tools and get updated versions regularly. In order to download the schema, click on “download as ZIP” option on the lower right corner of your browser (see picture).